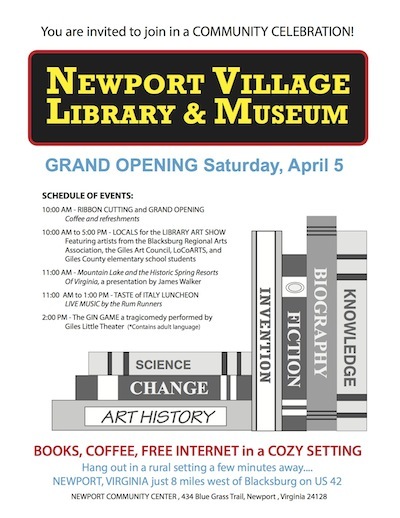 The Newport Community Center invites you to attend the Newport Village Library and Museum Grand Opening on April 5. ￼￼￼￼￼￼￼￼￼￼￼Books, coffee,and free Internet in a cozy setting. Hang out in a rural setting a few minutes away.... Newport, VA just 8 miles west of Blacksburg on US Route 42. The Newport Community Center is located at 434 Blue Grass Trail in Newport, VA.